1. Preheat the oven to 200°C, gas mark 6. Heat the fougasse according to the pack instructions. Meanwhile, remove the cheese from its box and unwrap (remove any labels). Place the lid under the base for support and return the cheese to the box. Score the top of the cheese in a criss-cross pattern with a sharp knife, then push the thyme sprigs into the cheese. 2. Place boxed cheese on a baking sheet and bake in the preheated oven for about 3 minutes or until just wobbly in the centre. Take care not to overcook the cheese or the box can split and the cheese will run out. 3. Meanwhile, place the asparagus in a large pan of salted boiling water. Allow the water to return to the boil and cook for a further 2 minutes until just tender. Drain thoroughly. 4. Scatter the cheese with the toasted walnuts and pumpkin seeds, and some more thyme leaves (if you wish). 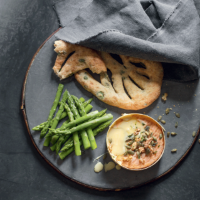 Serve with the asparagus and chunks of warm fougasse to dip. Simply return the cheese to the oven if it starts to become solid again.